I don’t care whether it’s called socialism, fascism, or communism, statism is evil and destructive. And going partway down that path with “democratic socialism” may avoid brutality, but the end result is still economic misery. In hopes of getting this point across, I utilize everything from humor to theoretical analysis. But my favorite approach, based on decades of experience with one-on-one meetings, public speeches, and private briefings, is to share cross-country comparisons. Such real-world evidence seems to be most persuasive. So it’s time to add to that collection. Let’s go back to 2011, when Catherine Rampell was with the New York Times and she wrote a column about a book by World Bank economist Branko Milanovic. She focuses on a powerful visual. "My favorite part of the book was this graph…on the vertical axis, you can see where any given ventile from any country falls when compared to the entire population of the world. …take a look at America. 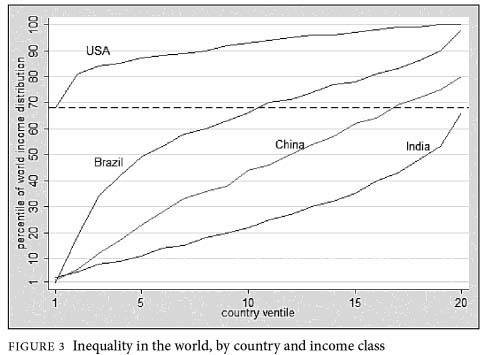 Notice how the entire line for the United States resides in the top portion of the graph? "That’s because the entire country is relatively rich. In fact, America’s bottom ventile is still richer than most of the world: That is, the typical person in the bottom 5 percent of the American income distribution is still richer than 68 percent of the world’s inhabitants. …America’s poorest are, as a group, about as rich as India’s richest." Here’s the graph that grabbed her attention. I agree with everything Ms. Rampell wrote about that graph, but let me expand the focus by explaining why this is yet another piece of evidence for the proposition that policy makers should focus on growth rather than (in)equality. From a leftist perspective, the ideal line for such a graph is horizontal because that represents complete income equality. And they naturally think that statist policies are more likely to produce an outcome closer to that redistributionist ideal (hence, their support for politicians such as Obama, Clinton, and Sanders). But the graph shows why they are so wrong to support ever-larger government. For instance, ponder the question of which nation produces better outcomes for poor people? Obviously, per-capita output for all income levels is higher in the United States, but the gap is especially huge for those with low incomes. There doubtlessly are many reasons for the output gap in the chart, but one logical explanation is that the overall burden of government is much lower in the United States (#16 in the economic freedom rankings) than in China (#111), India (#114), and Brazil (#118). By the way, some people may say it’s unfair to compare the United States with nations from the developing world. But the entire point of this comparison is that these other countries aren’t part of the “first world” in part because their economic policies are characterized by statism rather than capitalism. But for those who want comparisons among developed nations, I’ve reviewed evidence from the United States and Europe on many occasions and the results always show that the relatively more market-friendly policies in the United States produce higher levels of prosperity than the more statist policies of Europe. And if you want a more apples-to-apples comparison involving one of the most successful European nations, consider this chart showing the relative prosperity of different income levels in the United States and Sweden. The bottom line is that it’s very difficult to find any evidence to suggest that any group of people enjoys more prosperity in a nation with a larger burden of government. Which is why I’m still waiting for a leftist to successfully respond to my two-question challenge (and they actually only need to give an answer to one of the questions). Another good way of determining whether markets work better than statism is to see how fast nations grow over time. James Pethokoukis of the American Enterprise Institute shares a chart from Max Roser showing long-run changes in per-capita economic output for South Korea and Venezuela. The amazing takeaway (click chart to enlarge} is that Venezuela was about three times richer than South Korea about fifty years ago, but now that ratio is almost reversed. This is truly an amazing ratification of the all-important principle that sustained differences in growth have an enormous impact on a nation’s long-run prosperity. And it shows that nations from the developing world can experience “convergence” and join the first world if they adopt good policies. They don’t even need great policies. The key is simply to keep the burden of government at modest levels so the private sector has room to grow. P.S. For those wondering about my juvenile title, I probably watched Homeward Bound: The Incredible Journey over 100 times when my kids were young and I’m borrowing a very appropriate line from that film. P.P.S. For those who want more information about South Korean growth, check out this comparison of that country with its northern neighbor. P.P.P.S. And for those who want to learn more about Venezuela’s lack of growth, see how that country compares to Chile and Argentina.